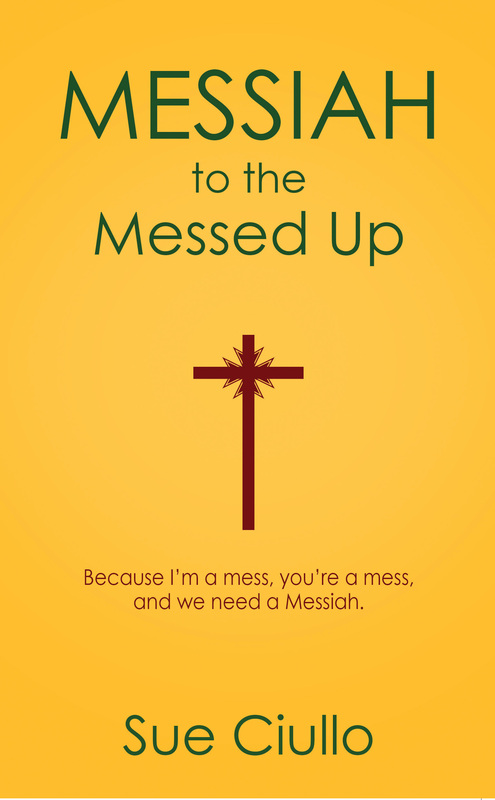 Title: Messiah to the Messed Up: Because I’m a mess, you’re a mess, and we all need a Messiah. Book Description: Spend some time with Jesus and something profound is bound to happen to your heart. Messiah to the Messed Up interlaces rich Scripture narratives with twenty-first century stories. These threads, woven together, create an unforgettable tapestry of the life of Jesus, an image so real that you will feel His presence. These stories are snippets of time with Jesus that will change your perspective on the Carpenter from Galilee. Why is that important? Because I m a mess, you re a mess, and we need a Messiah. It doesn’t happen often. I have read a lot of manuscripts over the years by aspiring writers, offering what help I can for the time I have. But I seldom see the result of their revisions. In this case, I did. This woman has become a writer! This woman is Sue Ciullo, and you will love her. You will love her honesty and her humility—from her stories about Lulu to strawberry wine to saying goodbye to her parents. The stories about her mom will not only touch your heart but change your heart. Sue will walk you though the biblical stories, and, before you know it, you will be walking with her through her own stories and into yours. They will show you—rather than tell you—how to listen well, how to love well, how to serve well. Most importantly, when you’re finished with the book, you will discover—the way the two disciples did on the road to Emmaus—that it wasn’t a stranger walking with you. It was Jesus. If you have ever felt too messed up for Jesus to forgive or use you, read Messiah to the Messed Up. Author Sue Ciullo uses scripture to introduce messed up characters that God forgives and uses in mighty ways. Before you give up, pick this book up! 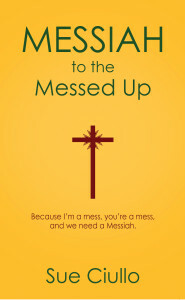 In her book, Messiah to the Messed Up, Sue Ciullo reminds us all of us that we are, indeed messed up. We’ve messed up in the past and we will mess-up in the future. While Christians believe Jesus was and is the long promised Messiah of Israel, a careful look at the stories of his life reveal that he had a particular penchant for those messed up. Jesus came to redeem all of us, including the messiest of us. Sue invites the reader to take a journey with this Jesus, the Messiah to the Messed Up. She invites us to experience the stories of Jesus found in the New Testament and rediscover the hope he brought to messy people in Israel and the hope he can bring to the messed-up today. Whether you have been studying the life of Jesus for years, or investigating his life for the first time, Messiah to the Messed Up will help you understand Jesus and his compassion for each us. If you’ve always wanted to know more about Jesus, if you’ve longed to see Him more clearly—let Sue Ciullo reintroduce Him to you. Messiah to the Messed Up delivers a long look at Jesus through the lens of love. See His love in the way He treated a whore or an outcast of society. Get a glimpse of it as it is acted out in the nitty-gritty of modern life. The beautiful message of Messiah to the Messed Up is that Jesus wants to touch each of our messed up lives and transform them with His love. I’ve spent many years working with the Bible–from study notes to study guides to inspirational stories to devotional thoughts. Sometimes I wonder if anything new can be said, and then someone comes along with fresh eyes on the stories we know so well. Sue is one of those people. In, Messiah to the Messed Up Sue draws us into the beloved Gospel stories by looking at them with fresh insight and good study information. Then she offers up stories from her own life, illustrating her love for her Messiah and how he has worked in her life. You’ll relate to her laughter, her joy, her grief, her repentance, her regret, and ultimately her complete and total love for her Savior. And you’ll be challenged to let that Messiah take whatever is messed up in your life and redeem it for his glory. Messiah to the Messed Up takes the stories of the Bible and relates them to real life and real time. Sue brings in her own stories to inspire us to receive the great gift of God’s grace through Jesus. Never again should we assume that we have to clean up our act to come to God. He calls us just as we are and then challenges us to be transformed. An inspiring and practical book that will change lives. Beautifully written, Messiah to the Messed Up will resonate with readers of today, giving fresh new meaning and perspective to centuries-old biblical stories. A must-read for those who know they’ve made mistakes and especially for those who think they haven’t. We’ve all fallen from grace, we’ve all messed up, and we’re all in need of a Messiah.